Editor of Vgorode-Donetsk Alina Balaban on how the events in the east are reflected on the life of regular Donetsk citizens. 1. What changed in the everyday plane? How do shops, hospitals, banks etc. work? There are many changes in everyday life: one cannot always pay the utility bill at the first attempt, if you don’t do it via the Internet. You often encounter closed backs. Medical institutions are working with interruptions. It seems the hospital is working but you cannot get an appointment with your doctor: they are either on vacation or on sick leave. They can also been understood, such a situation in the city, they are thinking first and foremost about their own safety. Shops and supermarkets are open. But depending on the situation. For example, when the ATO was in the airport, all shopping malls were closed, many supermarkets, and small shops and kiosks as well. The same with pharmacies. McDonald’s restaurants have been closed for two weeks now in Donetsk. I think the only thing that is irritating at the end of the work day is when you traditionally want to have a latte from McDonald’s. Sports clubs and gyms continue working in the usual regime. And it cannot be said that the people are going less. But the administrators warn that they will close in extreme cases, and the membership cards will be frozen. 2. What do Donetsk streets look like? The city streets have changed. The atmosphere is sort of depressing. There is no lively movement on Monday at 7 p.m. on the main street of the city. The marshrutkas are coursing as usual, the cars are still driving around. But I have already forgotten how the taxi dispatcher would tell me: “sorry, there are no free cars available now.” I haven’t been in a full marshrutka for a long time either. But roses are in full bloom on all flowerbeds. But this does not bring aesthetic pleasure. People still walk around the main streets and parks in the evening, but they do it quietly, somewhere foreign voices are heard. There are always free tables in cafés. The lack of students is very noticeable. 3. Where are the government bodies – the city, district ones, are they in their place or underground? The city council and the district executive committees are working on location. The mayor gives traditional daily press conferences, during which he laments the ATO and talks about the everyday problems of the city at the moment. No far-reaching plans, no perspective projects. The city has long forgotten about the nearest future, only today, only now, and if we’re lucky, then tomorrow or next week. Only the workers of the regional state administration apparatus can be considered “escapees.” Because the administrative building was first ruined, then turned into the citadel of anarchy, now the “PRD Presidium” sits there. All the structures of the Donetsk Oblast State Administration have been disbanded into various district executive committees and other administrative buildings in the city and are working. 4. What is the police doing – are they at their posts or are they in hiding? Can one call the police at all? Formally, there is a police service in Donetsk. But when it comes to calling them because “there is a shooting in your yard,” then, “sorry, there are no free patrol cars at the moment.” However, a pedestrian patrol can be seen in the city centre. Together with them, internationalist soldiers and civil activists (their chevrons say “Vityaz”) oversee order. Besides 02, there is a hotline in Donetsk, 15-85 or 335-27-85. By calling these numbers, the citizens can inform about all emergency situations and the situation in every city district. 5. How are the people behaving – do they gather and discuss or being cautious? The peoples’ behaviour today is desperation in their eyes, silence, hope. I forgot when I wanted to smile at a passerby or a kid with a balloon. But kids with balloons do not frequent the streets anymore. All the conversation in public places comes down to “what to buy and how much it is.” Today it is not just scary to talk about politics or convictions. Everyone is simply fed up. The people are tired. Everything they could have shouted at each other about, foaming at the mouth, has already been heard. One wants humanity, warmth. And it seems that the people are sharing this warmth, a final effort, baiting hope that soon everything will be over. The grannies by the front door now discuss poems and their granddaughters’ new sandals. Condemning phrases towards the politicians, “who are to blame for…” haven’t been heard for a long time. 6. What TV channels are working? Depends on the provider. “Donetsk Cable” – surprisingly, all channels are working. Many of my acquaintances lament that 1+1 and Channel 5 don’t work. They have cable. Those who have Matrix-TV – 1+1 and Channel 5 don’t work either. However NTV and ORT broadcasts have appeared. 7. What is the situation with the Internet and mobile service? There have been no problems in the city with the Internet at all. MTS is sometimes being “stubborn,” without any reason. While, say, in Sloviansk, service was being “suffocated” at first, and then the cell tower was damaged. 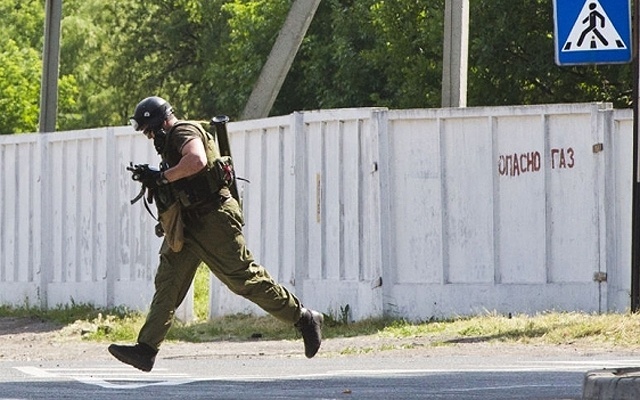 In Donetsk there has been no reason for interruptions. There have been no similar problems with other operators. 8. What about the cultural life in the city: cinemas, concerts, expos? This political and military chaos touched on absolutely all levels of life. While before (even back in April nothing happened) the majority of the intelligentsia, which had nothing to do with politics, lived its cultural life – went to expos, move showings, concerts. Today the feeling of being unneeded and isolation has escalated to the max. All the concerts in Donetsk are either cancelled or, best case scenario, postponed. Which is not surprising. Nobody want to risk, first with their lives, second, the lives of hundreds of people in the audience. As today accumulations of people are best avoided. The only exception is the bar “Gandzhubas,” where sometimes there are performances. The drama and opera theatre have finished their seasons preemptively. Movie showings are minimal. For example, the British Theatre Festival in the cinema was cancelled. And not many are enthusiastic about going to the movies. They can watch them at home. The expo centre “Art-Donbas” and the Donetsk Oblast Naturalistic Museum are the only museums open. The expos are completely different story. In Donetsk, there is wonderful platform for cultural events, located at an old factory, called “Isolation.” All the notable cultural events in Donetsk are held there. Everything began with “family weekends,” which were cancelled. Later the PRD guys occupied the territory. And now the workers of “Isolation” have reported that the territory has been looted and mined. 9. Where and how frequently are there shootings in Donetsk? Fortunately, I have not yet witnessed shootings in the city. But everyday Donetsk citizens are writing on social media that they could hear gunshots in one district or the other. But it is most likely to be warning shots or shots into the air or at the ground, or the PRD’s are simply making noise out of boredom. Here’s a story as an example. My friend went to work in the garden at the dacha during the weekend. And the dacha is with 500 metres of one of the roadblock at the entrance to Donetsk. He says that he could hear shooting from the roadblock. And periodically. But there are no shouts, no other noise. He approached it. And there, at the roadblocks, they have put bottles and cans into a row and are shooting at them. It is for the best. 10. What are the moods in Donetsk in general? For example, your acquaintances, are many people supporting the PRD’s, is there compassion, how are they acting? Out of my acquaintances, about 10 per cent support the PRD. But this is more like resistance to all things Ukrainian. Better the PRD than “Banderites.” The patriots for the most part have long left the city, some by circumstance, some were persecuted. And mainly because they have long accepted the fall of Donbas, long ago, before the business started stagnating here, before there were “separatist terrorists” with rifles here, but “pro-Russian activists” with sticks, bats and armature. I know several families that left for the villages in Donetsk oblast with their families. The villages that are under Ukrainian control. And they sometimes visit Donetsk on business and everyday matters. The youth has left Donetsk for the most part, they just packed a bag and bought a train ticket. And the parents even like it. Personally I can say that when you leave Donetsk, you feel indescribable relief. Numerous times, I have felt it myself, because I am forced to return time and time again to my seemingly familiar, but now so foreign, city.